Guest post by the regulated materials team. To introduce ourselves we are the Regulated Materials Management Office (RMMO). We are part of the Facilities Services Maintenance and Construction Division. Our role is to provide the service of identifying and regulating hazardous building materials. Our team has six members, our Manager Saeid Rastegar, four Industrial Hygienists and one administrative Fiscal Specialist. Our LEAN journey began as most do, with the three day preliminary introduction to LEAN and the coaching sessions. As we spent those three days identifying areas for improvement, we found out that we had a three to five year back log on our historical data base. The historical data base is a compilation of known hazards in each of our buildings at the UW. This data base was started about ten years ago and continues to grow. We resolved our backlog by exporting all the information from our work order database into a spreadsheet and by using a hyper link we created a direct link to all the reports themselves. So rather than having to update our records individually, we eliminated the backlog in a very short period of time. It only took an hour versus three to five years by utilizing technology. The historical data base is used to guide our employees to identify what hazards may or may not be impacted for the work that they will be performing. In many instances, employees are able to be advised that they will be able to use specific procedures when encountering lead or asbestos. We also train our employees in both of these procedures. In other instances, they are able to forgo testing and go straight to having a material abated as it was identified as containing hazardous materials. 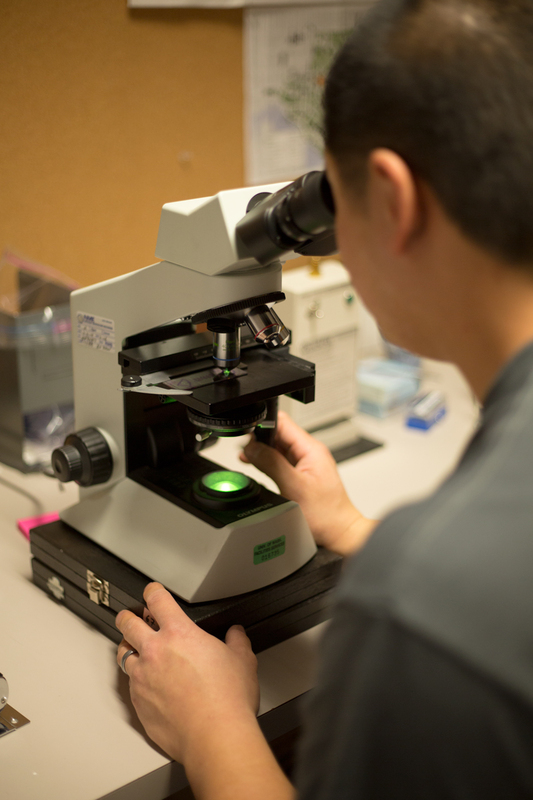 Regulated Materials team member Andrew Wong looks at material using a microscope. As we moved through our LEAN process we began to realize that our business process had a very specific dollar value attached to it. For example, if one of our shops was impacting a material that we have already identified as having asbestos, the shop could bypass the testing and that provided a cost savings to not only our Facilities Services crew, but to the UW client that they were working for as well. In other instances, the historical data base can provide information that would allow the crew to use the procedures that they have received in training and again they would bypass the cost of having the materials tested and this also provides an opportunity for our workers to use their training rather than having our outside contractors to do a costly abatement procedure. One more example would be to provide information to the crew that asbestos is present and another method of getting the work done would be implemented also saving that cost. We have always tracked the number of requests we have for historical data. So with that information we were able to develop a formula based on the number of requests we had, along with the average cost of testing and/or abating to show us the estimated amount of money we were saving. This cost savings was very significant. Our estimate revealed that our organization along with the UW community at large was saving about $520,000. It’s soft money but its money that we are not spending and money that we are saving our clients every time we do work for them. This number is based on our annual observations. So this is the money we have saved since we started using this historical data information and we expect this number to grow as more and more of our employees utilize this resource. If it had not been for the LEAN process, we may never have stopped to ask ourselves this question and realize what a valuable service we are providing not only to Facilities Services but to the UW community as well.